Sleep. We all need it, we all want it, and most of us don’t get enough of it. But how much sleep do you actually get? Some people might be surprised. Sleep is critical for learning, managing stress, regulating mood and promoting a healthy immune system. Sleep plays an important role in a person’s overall health. Sleep is critical for learning, problem-solving, managing stress, regulating mood and promoting a healthy immune system. Sleep also plays a part in preventing chronic conditions such as obesity, heart disease, diabetes and cancer. 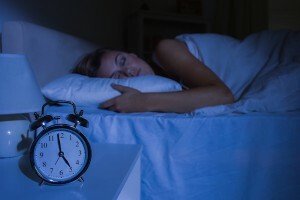 Although experts differ on the exact amount needed, adults typically should get seven to nine hours a night, according to the National Sleep Foundation. That number increases to 8.5 to 9.5 hours for teens and continues to increase the younger the child. On Sept. 27, Healthy IU, the university’s workplace wellness program, is hosting the first Sleep Walk on all campuses to raise awareness about sleep health. The walks will take place at noon. Registration is available online, along with campus routes. The walk came about following the 2015 Fairbanks School of Public Health Workplace Wellness Survey that showed over one-third of IU employees are not regularly getting enough restful sleep to function well in their work and personal life. That finding is similar to national data that shows more than a third of Americans aren’t getting enough sleep. The survey also showed that nearly 70 percent of IU employees said stress, from all sources at work or at home, affected their health in the past year. “We are hoping the Sleep Walk can raise awareness about the benefits of sleep that include managing stress and regulating mood,” said Steven Lalevich, registered dietitian at the IU Health Center and Healthy IU lead team member for the Sleep Walk. In honor of the walk, Health and Vitality asked IU experts Manchanda; John Bates, professor in psychological and brain sciences at IU Bloomington; and Julie Otte, associate professor at the IU School of Nursing, to share their expertise on sleep and tips for getting a better night’s rest. Take the time to wind down. It is important to have a pre-bedtime ritual, so you can relax before going to sleep. Avoid exposure to “blue light” emitted from televisions, computer monitors, electronic readers/tablets and cell phones, which can affect levels of the sleep-inducing hormone melatonin. Cut out caffeine consumption, nicotine, alcohol and other recreational substances before bedtime. Remain active during the day and try to avoid napping. Additional healthy sleep basics are available on Healthy IU’s website.